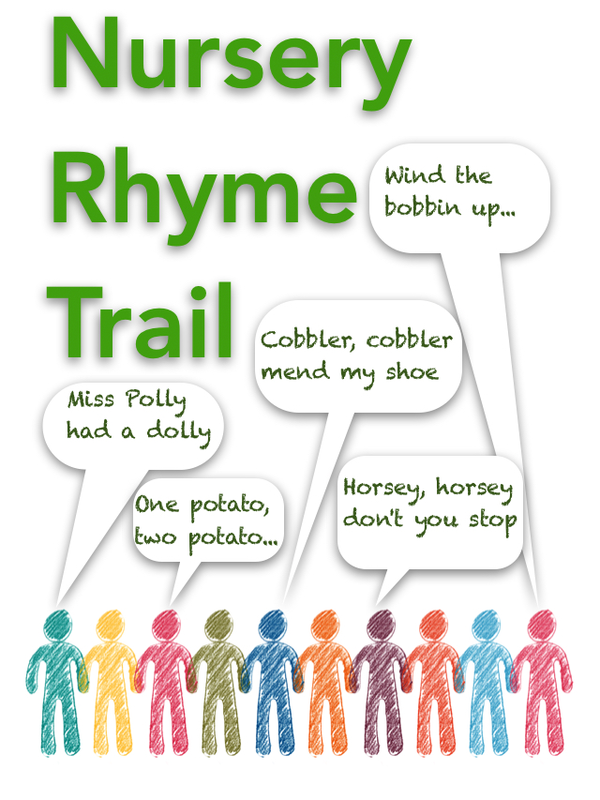 We welcome school and community groups to Ramsey Rural Museum and we will work with you to plan a full or half day visit linked to your objectives. The museum exhibits can support many parts of the school curriculum. Click HERE for a document linking museum exhibits to the primary school curriculum. The charge for visits and outreach work is £2 per pupil (minimum charge £30). Click HERE do download the booking form. Bring a set of artefacts to you to support speaking & listening and writing. Organise an online question and answer session. Show exhibits and artefacts using FaceTime or Skype to children and/or staff. For visitors, we have placed some pre-recorded buttons around the museum with links to the exhibits. Visitors follow the map, press the button and sing along. Ask us about bringing this activity into your classroom with a large map, photos and artefacts for the children to handle, talk and write about. 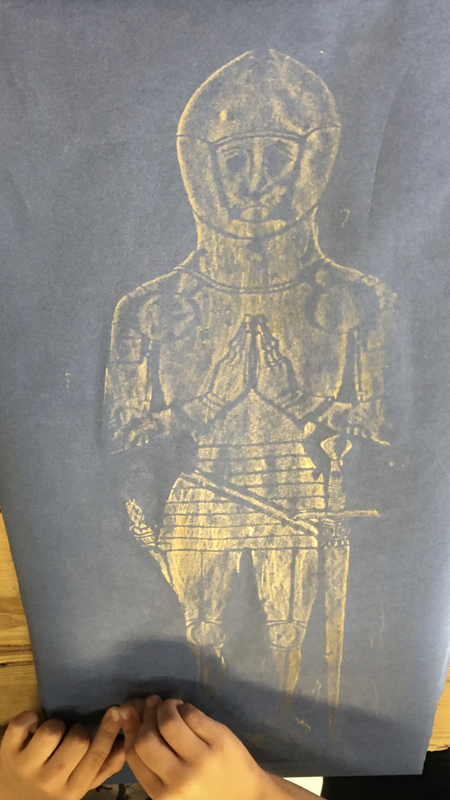 Once popular in Victorian times, this calming and absorbing activity is suitable for all ages.We have a set of replica brasses, paper and waxes, and someone can talk about and demonstrate the basics. Extend this creative activity in the classroom with some guided research and non- fiction writing. Created as part of the 2019 Talking Together Cambridgeshire County Council initiative, the Treasure Chest is a collection of objects from around the museum. The contents have been specifically chosen for young children to touch and examine at close quarters. Information about each object is available so that adults can engage children’s curiosity in talking and learning about the past. Come to the museum to SEE the Early Years Treasure Chest. Handle each object and talk about what it is, how it works, what it was used for and if we still use something similar today. Examine it closely with a magnifying glass or kaleidoscopic viewer or measure it with a tape measure. Draw or photograph the objects to talk about when you get home. A LOAN box is available for Early Years settings and nurseries. 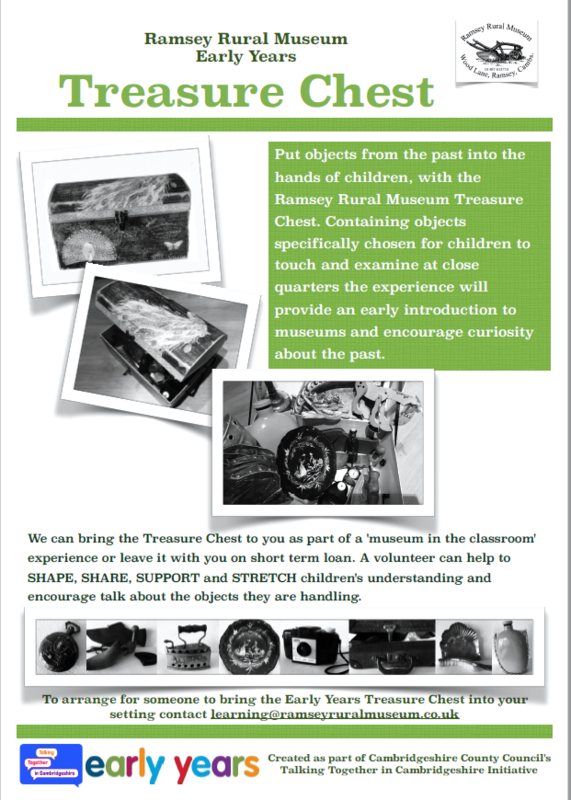 See the poster included for more details or email learning@ramseyruralmuseum.co.uk.